New projections by the Congressional Budget Office show that this could be a record year for federal tax revenue – according to the CBO, the federal government should be bringing in $2.7 TRILLION this year, an all-time record. : At first blush, one would think this is good news, and a vindication of President Obama’s “balanced approach.”: But even though we’re looking at the possibility of record-high tax revenues, deficits are projected to be around $850 billion. So the big question is, does America have a spending problem? 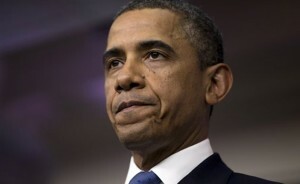 : Will President Obama’s “balanced approach” work to get America back on the right track? The projection for tax revenues puts America above 2007’s all-time-high in tax revenues, yet while revenues are projected to be up about 5.5% over 2007, government spending is projected to be up just over 30% from 2007 – and sequestration won’t even begin to effect that. : Naturally, you would think, then, that the “balanced approach” widely advertised by President Obama would be the perfect thing to bring our deficits down through spending cuts, and pay down our debt through higher revenues. But there is one, huge, glaring problem. What we’re hearing about is a projection by the CBO, which has a tendency to be over-optimistic in its projections, usually for no other reason than that they don’t take extenuating circumstances into account. Historically, higher tax rates lead to lower tax revenues, as they depress economic activity. This is further evidenced by the fact that in 2007, the (un-paid-for) Bush tax cuts were in place, yet we actually had record revenues…but if you check the numbers from when taxes were lowered under Kennedy, Reagan, and Bush, the evidence is clear. While President Obama routinely talks about the need for a “balanced approach” that combines higher taxes with cuts in spending, he has proven to be extremely eager to raise taxes, and extremely reluctant to cut spending. : Just look at the president’s rhetoric leading up to the implementation of the sequester cuts, which aren’t even true spending cuts. Despite the sequester cuts going into effect, Secretary of State John Kerry announced that we are sending $250 million to the Islamist regime in Egypt, and Homeland Security just spent $50 million on new uniforms for the TSA…meanwhile, the administration takes token measures to make sure that the public feels the “effects” of sequester. While President Obama pays lip service to spending cuts, he often waxes eloquent about all of the new ways he wants to “invest” (spend) our money. : Just based on the agenda he laid out in his State of the Union speech, there is no way he will ever be able to cut enough to outpace his proposed new spending, particularly given the vehemence with which he opposed the modest cuts in the sequester. The bottom line is, President Obama doesn’t believe in any “balanced approach.”: Like Democrats throughout recent history, he is all about raising taxes on Americans who already pay too much to the government, and he will fight tooth and nail against any and all proposed spending cuts. : This is the reason he came up with the idea for the sequester: it was blindingly obvious that the bi-partisan “super committee” was going to fail – all that had to happen was for the Democrats to refuse any and all cuts put forward by the Republicans on the committee, and that is exactly what happened. : The president then parlayed the super committee’s failure into an attempt to look like a hero both to those who supported and opposed the automatic sequester cuts – he vowed to veto any attempt by Republicans to avoid the cuts, then promised in the presidential debates that “the sequester will not happen.”: But as it turns out, all of his blustering amounted to was the President of the United States holding out for higher taxes yet again so that he could smear his political opponents. : And he’s still holding out for higher taxes – that is why the Executive Branch is deliberately engineering the sequester cuts to have the biggest impact on the public that they possibly can. So where does all of this get us? : Well, the projections are up, but the reality will likely be down. : The sequester “cuts” are in place, but the government is still spending more this year than it did last year. : The Republicans are still a bunch of spineless cowards who may or may not (more likely not) stand up for what is best for America when the pressure is on. : President Obama is still an anti-American president who knows nothing about how economics works and will do as much as he can do destroy our nation over the next 4 years. : It doesn’t matter what the CBO is projecting, because reality will tell a different story entirely.